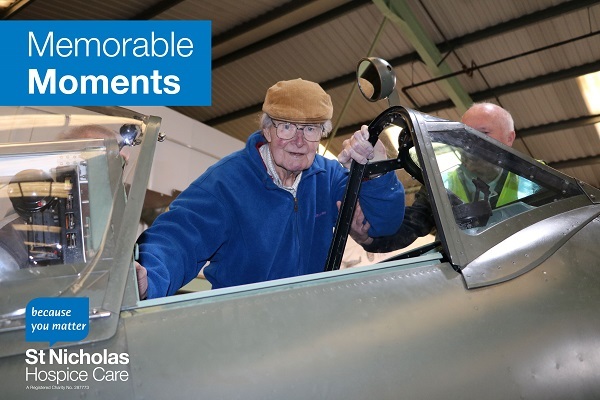 The Hospice’s Family Support team flew into action last week after a patient on our Sylvan Ward told them his dying wish would be to fly in a Spitfire. 84-year-old John has fond memories of hearing Spitfires flying above his Yorkshire home and his three brothers worked on them during their time in the RAF. After hearing his request, Bianca, Family Support Practioner, contacted Biggin Hill Heritage Hangar to see if they could help. The Biggin Hill team kindly invited John and his wife Heather for a private tour of the hangar in Bromley, Kent. The Hospice is happy to help create such a memorable moment for John and Heather, who celebrate their 60th wedding anniversary this week!